German Chancellor Angela Merkel officially welcomes China’s President Xi Jinping to the opening day of the G20 summit in Hamburg, Germany, July 7, 2017. This article was first published by the Mercator Institute for China Studies. Angela Merkel finds herself in an awkward position on her visit to China this week. The trip—her 11th to China since she became chancellor in 2005—should be the routine courtesy call to mark the beginning of her fourth term. But nothing is routine these days. At a time when the United States is overturning the fundamental rules of the international order, the European Union and Germany have to test new ways of working with Beijing. U.S. President Donald Trump’s attack on multilateralism may push Merkel into an unlikely—and uncomfortable—alliance with China. This is at least the case for issues on which both sides feel the need to hedge against U.S. policies with potentially destructive consequences for world trade and world peace. Saving the WTO and saving the Iran nuclear deal will be at the top of the agenda of Merkel’s talks with Xi in Beijing. As export nations, China and Germany share the interest in open global markets and free trade flows—at least in theory. Under different circumstances, the German government would seek transatlantic coordination in urging China to lower barriers to market access for American and European investors. Instead, Merkel is forced to rely on China to uphold the principles and rules of the current global system. Germany and Europe hope that Xi will take on the responsible leadership role he has promised the world in Davos last year. The common goal has to be to protect the global trade regime from the American onslaught onto their legitimacy, but also to renew the system in a way that will make it attractive for all again, even for the United States. So far, China’s announcements contrast with the country’s actual foreign economic policy, which excludes foreign companies from many lucrative markets and investment opportunities. Now is the time for the Chinese leadership to show that it is serious about open markets and free trade. China has announced a number of important steps in that direction over the next years. But in the face of the open current attacks from the U.S. as well as growing public suspicion over Chinese investment in the EU, Beijing will have to offer more if it wants to prove its good intentions and restore faith in the liberal trading order. This is also true for Xi’s signature Belt and Road Initiative. 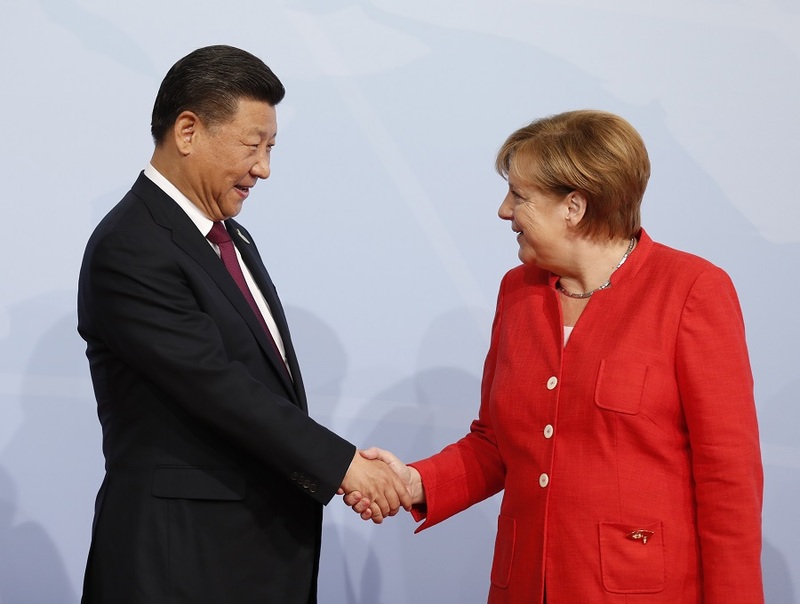 Beijing can be expected to ask Merkel to sign a MOU in support of the Chinese-led Eurasian—and increasingly global—connectivity project. And just like other European leaders before her, Merkel will refuse to honor the Chinese request. In itself, the Chinese push for improving the transportation and communication infrastructure between Asia and Europe should be a welcome endeavor. But the way China has steamrolled recipient countries has generated skepticism. In an unusual step, the IMF has recently warned these countries of taking on excessive debt loads that would create dependencies on China. Despite all these concerns, Merkel has to push for expediting the languishing talks between the EU and China about a bilateral comprehensive trade and investment agreement. Successful negotiations would generate pressure on the United States, which has extracted itself both from transatlantic and transpacific negotiations. Moreover, it is in both sides’ interest to limit the privileged role of the U.S. dollar as an international lead and reserve currency. China has been working towards this goal already, but the EU has so far been cautious to not offend the transatlantic ally. Europeans will have to define and defend their interests vis-à-vis both China and the United States if they don’t want to be caught up in a dual squeeze between Chinese and U.S. economic nationalism. They should develop a strategy to deal with the growing U.S.-Chinese competition, not just on trade but also on international standard-setting. For example, Europe should work on developing its own rules for cyberspace and the digital economy before the two other powers have divided up the world. But so far the EU has not even completed its internal common digital market. Managing the relationship with China will be a tightrope act for Merkel. A rising China is a competitor, not just for European companies but also for European norms and values. But the fact that there is no transatlantic ally ready to have Europe’s back means that siding with Beijing on selective issues will be necessary for the EU and Germany to carve out their own diplomatic and economic space. At least for this visit, the shared interest in saving the Iran nuclear deal and the WTO will provide an opportunity for Chinese-German cooperation, perhaps preparing the ground for tackling trickier bilateral issues down the road.